First of all, let's look at how distillation works. We're generally familiar with how distilled water is produced. The water is heated, and the steam or water vapor is conducted away in a tube. If the tube is looped downward and cooling is applied below the hump, the vapor is condensed and distilled water obtained. This is called "simple" distillation, i.e., removing a volatile substance (water) from non-volatile substances (lime, impurities, etc.). "Fractional" distillation on the other hand is a different type of distillation used to separate mixtures of two liquids with different boiling points, such as a mixture of alcohol and water. 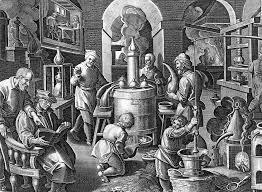 Wikipeadia defines fractional distillation as "the separation of a mixture into its component parts, or fractions, such as in separating chemical compounds by their boiling point by heating them to a temperature at which one or more fractions of the compound will vaporize. It is a special type of distillation. Generally the component parts boil at less than 25 °C from each other under a pressure of one atmosphere. If the difference in boiling points is greater than 25 °C, a simple distillation is used."